Here we are again, friends! It’s late October, you’re already PSL’d out, and oh so tired of wearing long pants. 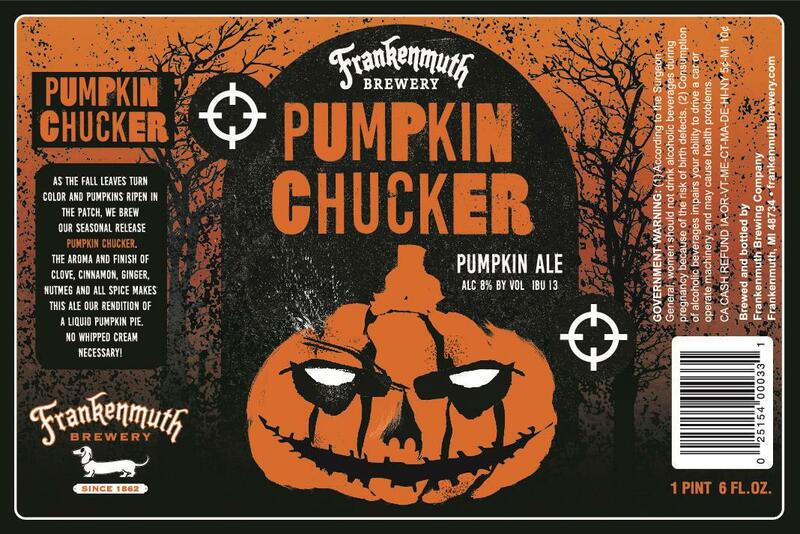 No doubt you’ve had a couple of pumpkin beers. Love them or hate them, they go with the season like crunchy fallen leaves and fake Target spider webs. 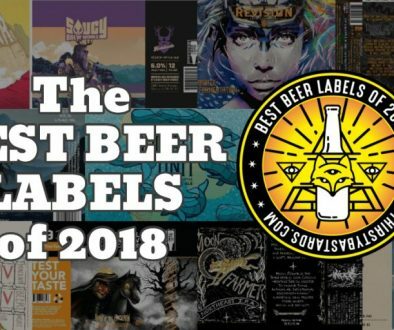 We happen to think they are some of the best labels made all year, so we scanned and searched for the latest and greatest and chose these 13 as the absolute finest for you to admire. In case you blinked, we didn’t do a 2017 list. Heck, there’s even some repeat customers, with new versions, from previous years’ posts. 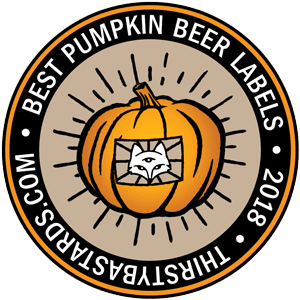 The labels were so bad last year, it wasn’t worth it to write a post of the “Best 2 Pumpkin Beer Labels”. Like most things, I blame Trump even though Jared is probably in charge of he Alcohol and Tobacco Tax and Trade Bureau. But I digress. Without further ado, grab a handful of Fun Size treats and pour these masterpieces into your eye holes! The following labels were registered with the Alcohol and Tobacco Tax and Trade Bureau in the past year. 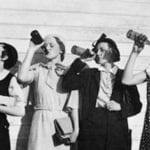 They have been selected for their aesthetic appeal or simply because we thought they were really cool. 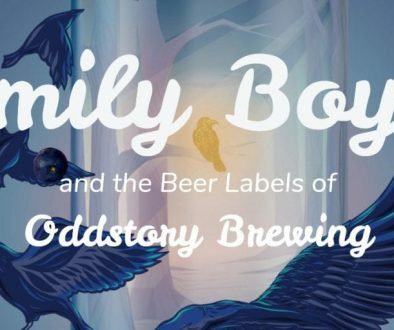 I reached out to Joe Osberger to get the story on this label by Frankenmuth’s house artist Justin Hein. 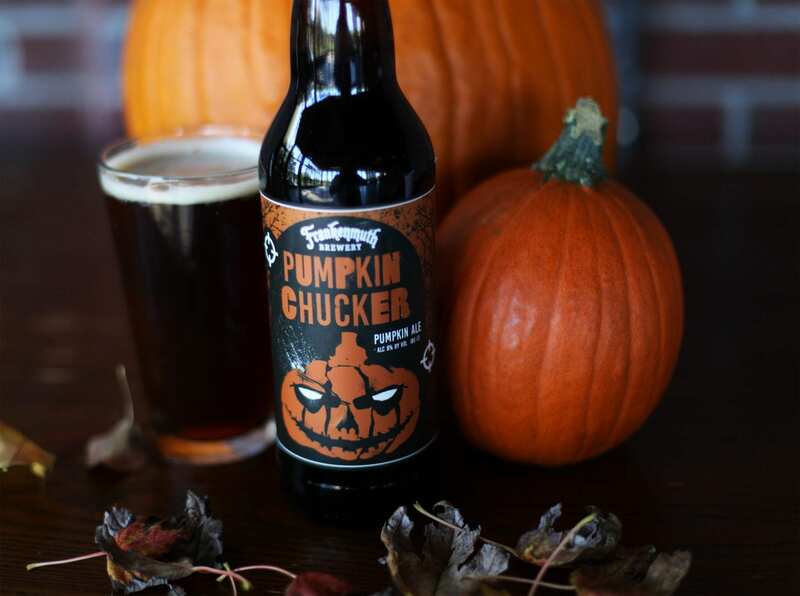 “The name Pumpkin Chucker is a play on the large catapults or trebuchets used to fling rocks, flaming oil or in our case pumpkins. A local farmer has a 40 ft. tall trebuchet who launches 60 to 80 lb. pumpkins beginning in September until they are gone in October. We thought that was kinda cool. 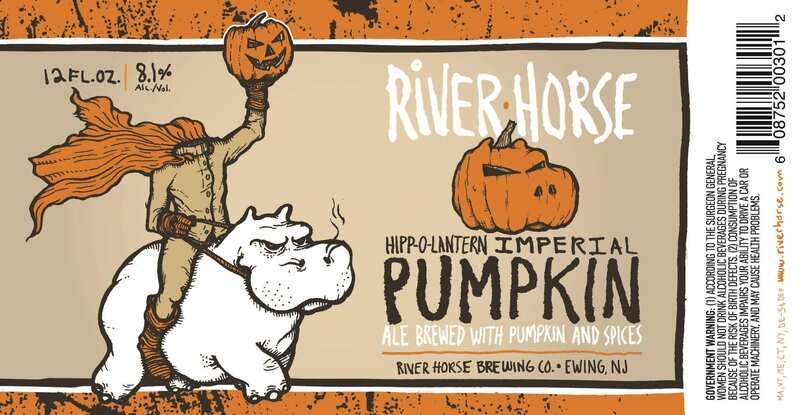 “The Hipp-O-Lantern label is a play off of “The Headless Horseman”. The “horse” correlation seemed like a natural fit, and all of the imagery for that tale shows a really aggressive looking horse. We thought it would be cool to have a hippo looking the same, since most of our labels are more on the light hearted/goofy side. “The inspiration for all the Ship Bottom labels is a beach, surf, chill vibe, so when Rob told me he was doing a pumpkin ale, the big question was how do we make it ‘beachy’ or relate to any kind of surf/shore experience… after all Halloween/pumpkin does not usually enter peoples mind when they think beach, shore, or vacation. So after multiple concept sketches I ended up thinking, what if the ‘pumpkin’ was an old divers helmet and he was doing an underwater/sunken ship exploration, since Ship Bottom’s name is based on a sunken ship. We’re always fans of overlapping imagery of the Mexican Day of the Dead with the Halloween season. 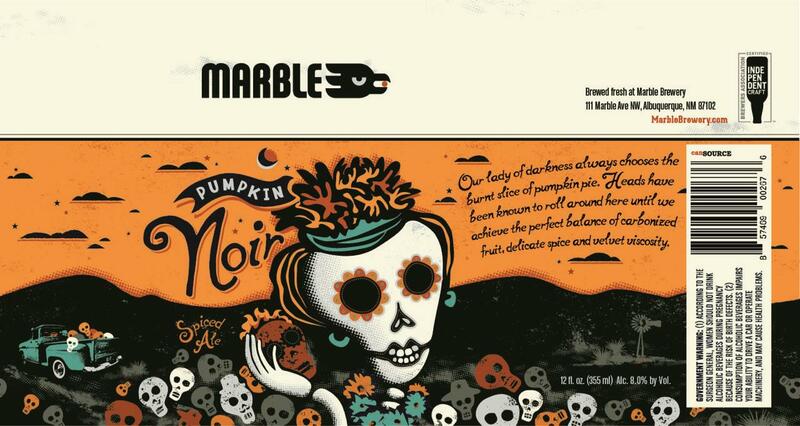 Marble’s “lady of darkness” is a gorgeous example. President and Brewmaster, Ted Rice, says, “I think this image represents Pumpkin Noir so well because they have so much in common. Both are dark, alluring, intriguing, and heady.” Pun intended? If you like this year’s Pumkin Noir label, check out the equally festive 2016 version! I feel like you can slap ol’ Tilly on any label and make it pretty chilling. Tilly might also want to lay off the espresso beans… and now I want espresso beans in all of my beers. 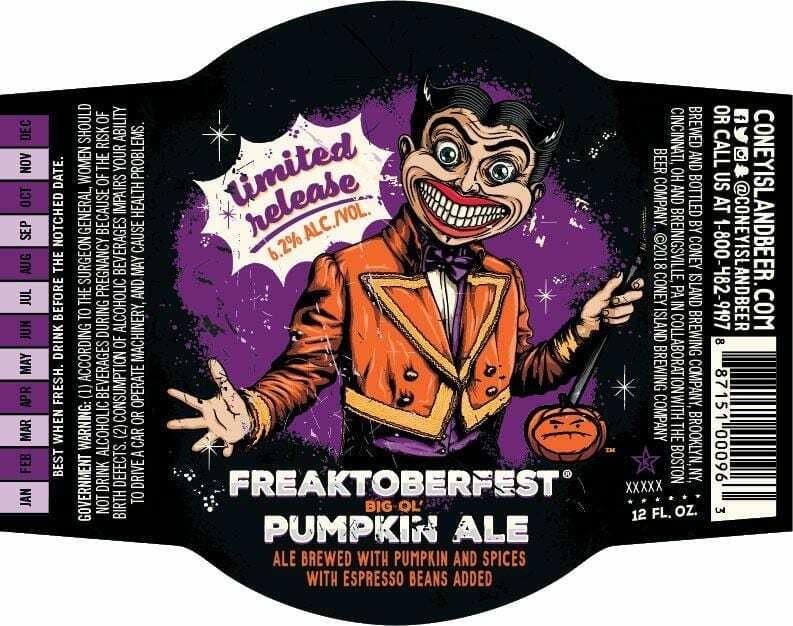 Freaktoberfest is always a disturbing label. That’s why we added the 2016 version to our Best Of.. list! 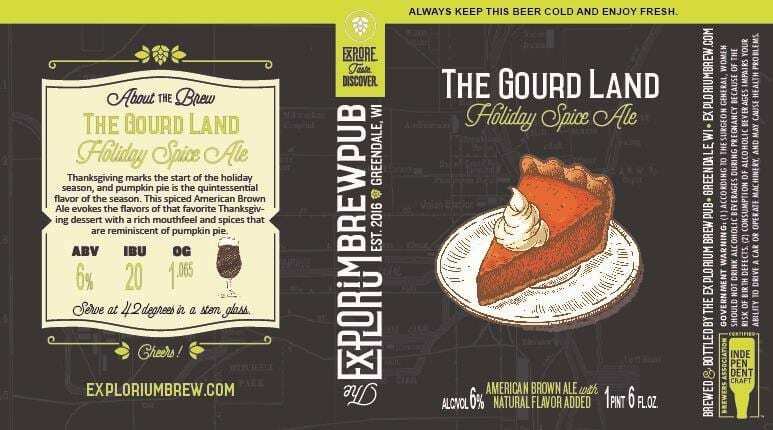 Owner and Proprietor, Mike Doble, did the design and artwork for this festive label. “Most of my early labels were developed for simplicity and to evoke flavors through imagery. This beer is a brown ale that is spiced with pumpkin pie spices, but there is actually no pumpkin in the beer. 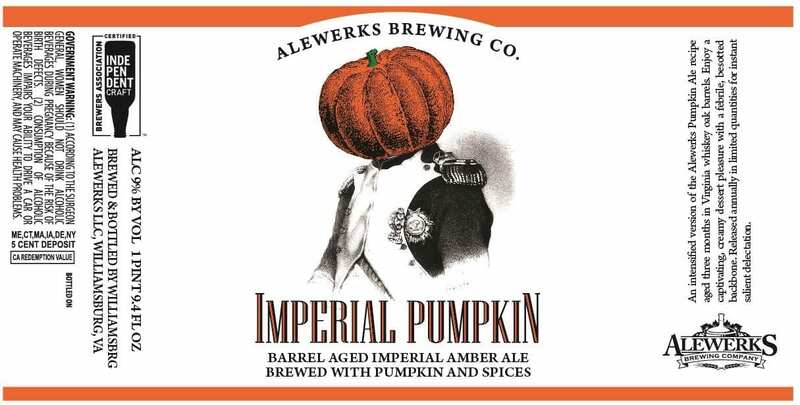 With the addition of lactose for sweetness and a bit of creamy mouthfeel, it’s like pumpkin pie in a glass. 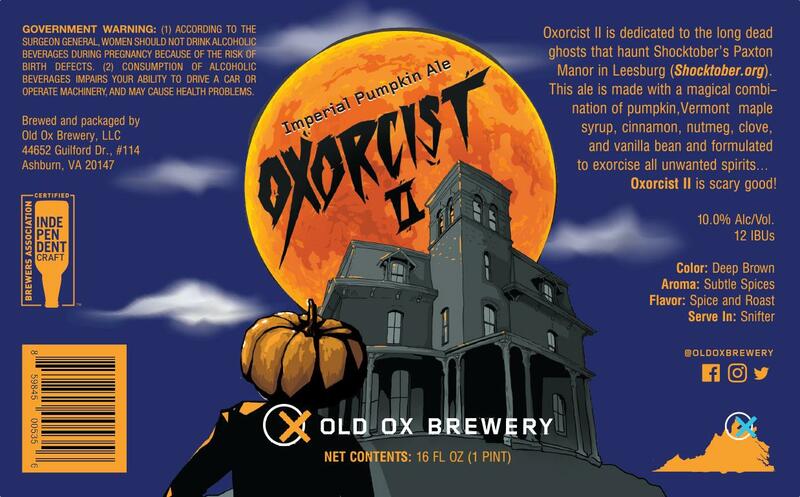 Thus the image of the slice of pumpkin pie with a dollop of whipped cream on top to prep the mind for the flavors in this beer. 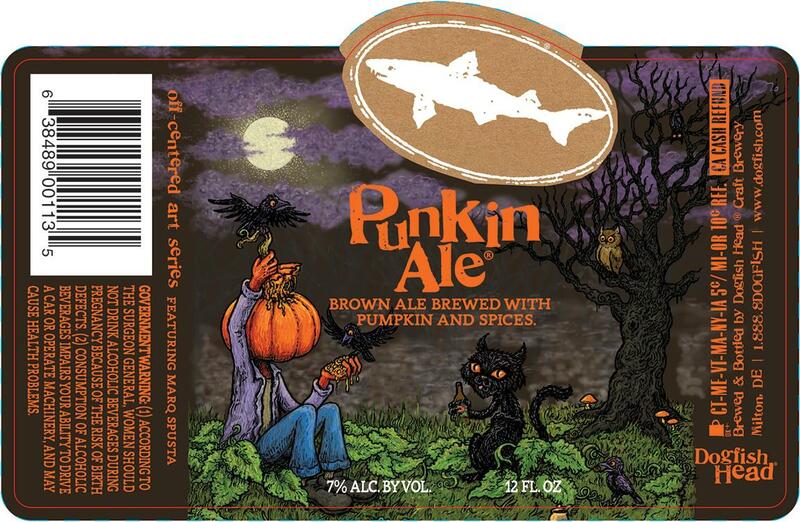 As you probably know, DFH does an amazing label for Punkin every year. 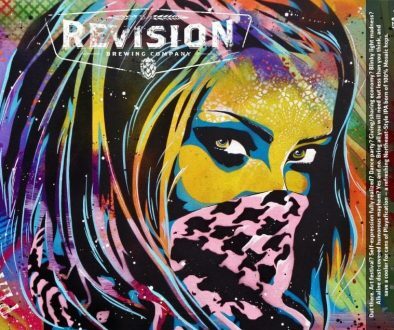 Check out our review of 2016’s version here. If Oxorcist II is a sequel, we wish we were around for the original so we could see both! 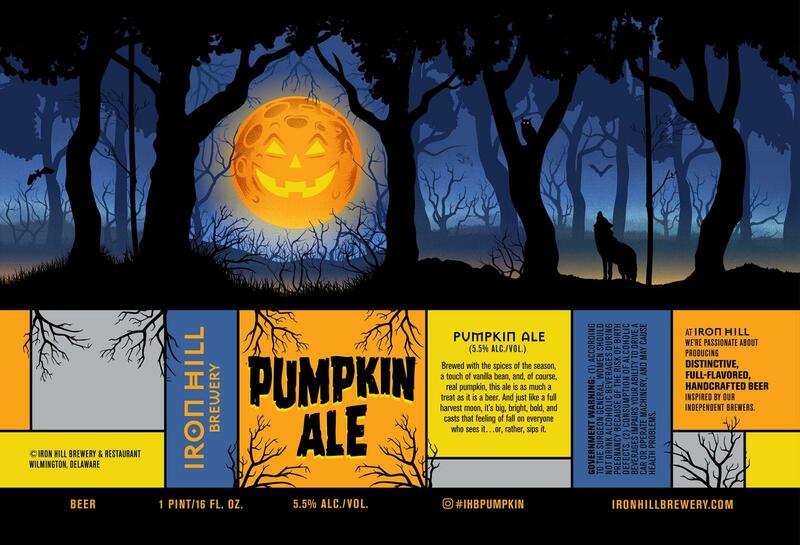 This label has some great elements – haunted house (presumably), head-replaced-with-pumpkin, giant, chilling moon, and a historical reference we’d love to hear more about! There’s not enough tankards made of gourds. Just sayin’. 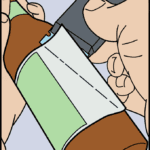 It’s very clever to make the statement “100% Natural” in your illustration and not in the copy on your label. You know, just in case. 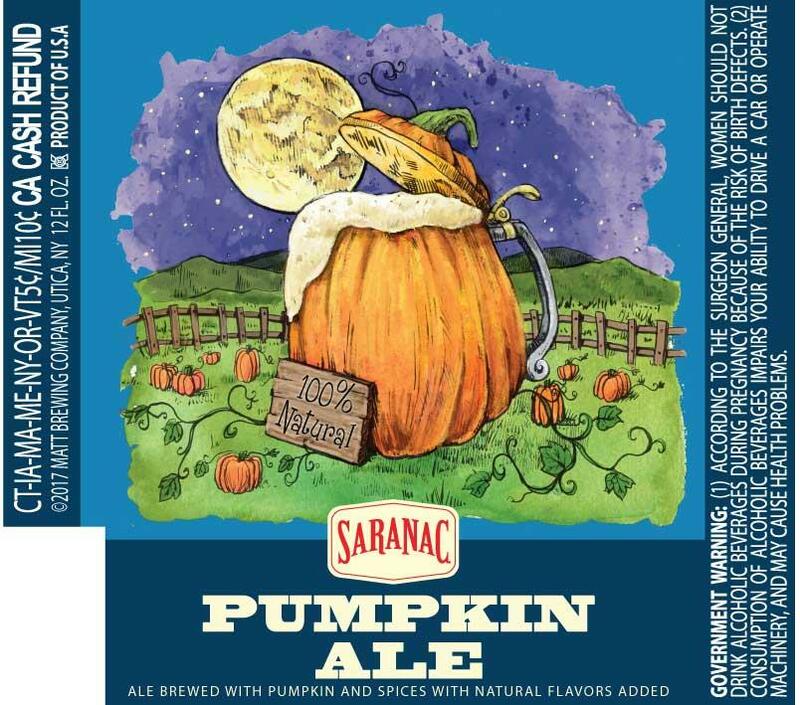 We featured Saranac as a great example of how to do a Blonde Ale label without featuring an objectified blonde woman. 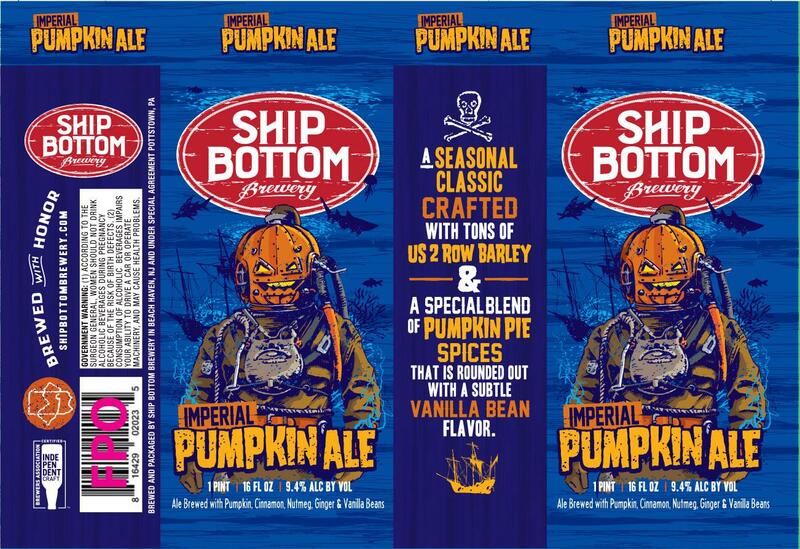 You guys at Ship Bottom were wondering how to make a nautical-themed pumpkin ale label? 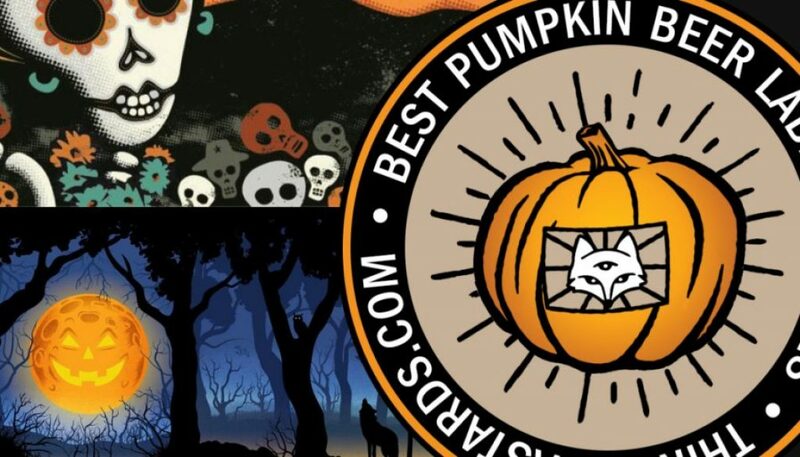 Did you consider a surfing jack-o-lantern? The extra “G” is for “gourd”. There’s a lot going on here on this label. Gonzo was not available for comment, so we’ll just say that we chose Hollow Head for it’s creepy skull-cauldron and misty graveyard scene. 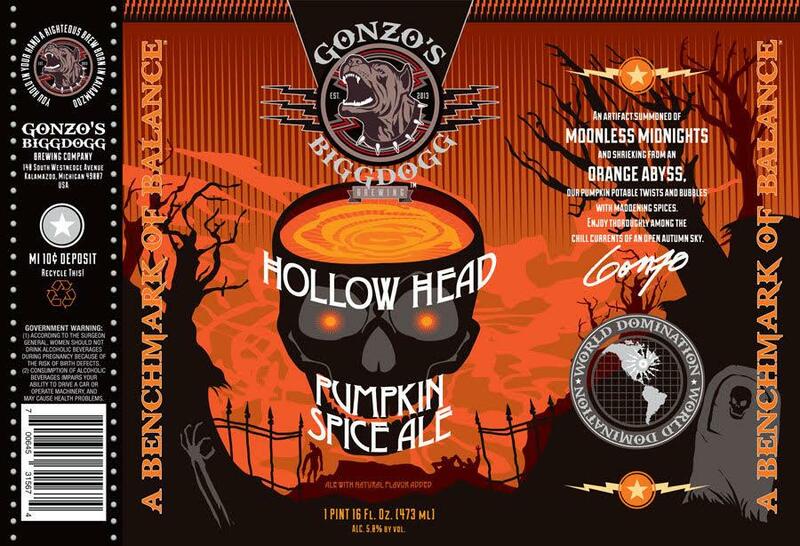 Gonzo could do with a few less messages on his labels, it’s true, but this label delivers the spooky. Josh says I should leave out the stinkers that I find, but when they’re THIS BAD, I have to call them out.